Domaine Ferrando is one of the newer, really hot properties in the Chateauneuf du Pape appellation. 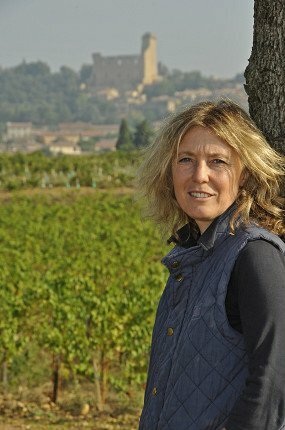 Domaine Ferrando is owned by Isabel Ferrando. Since their debut vintage in 2004, they have been on fire! Isabel Ferrando did not intend to have a career as a winemaker. In fact, her first career was in the banking industry. Isabel Ferrando changed her life, moving from the financial world to a life in wine. Isabel Ferrando learned about winemaking in the Gigondas appellation, while working for Raspail Ay. Isabel Ferrando founded the estate in 2004 when she purchased 3.9 hectares of vines in the southern part of the appellation. The goal, according to Isabel Ferrando was to create a wine that was distinct from Domaine Saint Prefert, her other Southern Rhone property. The difference for her was about the uniqueness of terroir in each location. To help her realize her ambitions, she brought in Philippe Cambie as the consultant. The best vintages of Domaine Isabel Ferrando are: 2018, 2017, 2016, 2015, 2012, 2010, 2009, 2007 and 2005. Domaine Isabel Ferrando Colombis is made from 100% old vine Grenache that ranges in age from 65 years to more than 100 years of age. The terroir is mostly sandy soils, which helps add to the elegant profile of the wine. Domaine Ferrando Colombis made its official debut with the 2004 vintage. The percentage of stems included varies, from vintage to vintage. For example, in 2009 and in 2010, two very ripe vintages, Colombis was vinified using only whole cluster fruit which included 100% of the grape stems during the fermentation. That has not always the case here. But starting with the 2009 vintages, the berries have not been destemmed. Domaine Isabel Ferrando Colombis is made from 100% old vine Grenache. The terroir is sand, with rocks, stones, and clay soils. The vines are planted in the Rayas, Cristia and Colombis lieux-dits. The wine is aged in a combination of short, conical shaped oak vats and used French oak barrels. Not much of this wine is made. Production of Ferrando Colombis is on average, about 550 cases per vintage. This is a great expression of Chateauneuf du Pape and while it can be difficult to find, especially after the wine has been in the marketplace for a few years, it is worth the effort to find a few bottles. Domaine Isabel Ferrando also produces red and white wine in the Cotes du Rhone appellation. Domaine Isabel Ferrando can be enjoyed young, with about 1-2 hours of decanting. This allows the wine to soften and open its perfume. Older vintages might need very little decanting, just enough to remove the sediment. Domaine Isabel Ferrando is usually better with 3-4 years of bottle age. Of course that can vary slightly, depending on the vintage. In the best vintages the wine should be consumed within 4-18 years after the vintage. Domaine Ferrando is best served at 15.5 degrees Celsius, 60 degrees Fahrenheit. The cool, almost cellar temperature gives the wine more freshness and lift. Domaine Ferrando is best served with all types of classic meat dishes, veal, pork, beef, lamb, duck, game, roast chicken, roasted, braised, stewed dishes, sausage, barbecue and cassoulet. Domaine Ferrando is also good with Asian dishes, hearty fish courses like tuna, mushrooms pasta, eggplant, tomatoes and cheese. The white wine of Domaine Ferrando is best served with a myriad of different seafood dishes, shellfish, crab, lobster, sushi, sashimi, chicken, pork and veal, as well as Asian cuisine. Deep ruby in color, the wine is concentrated, lush, round and peppery fresh. There is a definition to each layer of fruit that varies from black raspberry to kirsch. Opulent, rich and fresh, this is pure velvet in the mouth. The finish, with its purity of fruit seriously goes on and on. Complete decadence is the best way to describe this must have wine. The wine is made from 100% old vine Grenache. For a wine of this quality, it is one of the steals of the vintage! Made from 100% Grenache, the wine is silky, sensuous and fresh, with symmetry and a poised, elegant, ripe, sweet, cherry dominated finish. This is a really solid effort for the vintage. A mélange of fresh, sweet, ripe red berries and spices are at the front of this wine. It’s sweet, spicy, fresh character leaves a good impression on the nose and an even better one on palate. A few years will add more to this 100% Grenache wine. Medium bodied, flowery red berries, soft, open and forward, the wine is all about the elegant fresh, ripe cherry and garrigue character that carries through the finish. Full-bodied, but not even close to over the top, the combination of luscious, silky textures, pure, sweet, fresh, black raspberry and kirsch and length and vivacity makes this perfect for current drinking. You can also age it for more secondary development. If you like your Chateauneuf du Pape produced from loads of perfectly ripe dark, red fruit, topped with pepper, garrigue and fennel, with lush, juicy fruits and plush textures that end with a long, mouth filling, fresh, sweet, enticing finish, you came to the right place. A beautiful expression of sweet, ripe, kirsch, juicy fresh, black berries, thyme and voluptuous textures. The wine has richness, ripe fruits and a lively, fresh character giving it vibrancy. Mind blowing juice from start to finish! The explosive nose, with its herbs de Provence, black pepper, thyme and sprigs of mint topped with olive tapenade is off the hook. But the incredible wall of opulent, perfectly ripe, fruit, spice, kirsch liqueur and juicy plum notes, with its fat, juicy, opulent, viscous, silky textures must last at least 50 seconds. Little air is needed for this baby, pop and pour works just fine. If someone wanted to score this just a bit higher, I get it, because it is that good! From 100% old vine Grenache, the wine blasts off with cherry liqueur, black pepper, Provencal herbs, strawberry jam and spicy raspberries, Full bodied and packed with sweet, ripe Grenache, this ostentatious Chateauneuf du Pape delivers the unique combination of pleasure and unique character for a fair price. This is drinking great today. The wine is lushly textured, concentrated, vibrant and lusty. There is a depth of flavor with the juicy, ripe, kirsch with overtones of thyme, assorted herbs, pepper and sweet cherries.